A new US assessment of Venezuela's oil reserves could give the country double the supplies of Saudi Arabia. 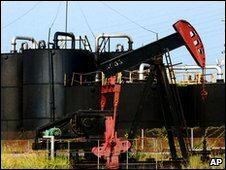 Scientists working for the US Geological Survey say Venezuela's Orinoco belt region holds twice as much petroleum as previously thought. The geologists estimate the area could yield more than 500bn barrels of crude oil. The USGS team gave a mean estimate of 513bn barrels of "technically recoverable" oil in the Orinoco belt. Chris Schenk of the USGS said the estimate was based on oil recovery rates of 40% to 45%. "I doubt the recovery factor could go much higher than 25% and much of that oil would not be economic to produce", he told Associated Press news agency. Venezuela holds the largest oil reserves of any Opec country outside the Middle East. Saudi Arabia has proven reserves of 260bn barrels.